Led by trombone powerhouse, Big Sam Williams, Big Sam’s Funky Nation gets audiences moving with their funky tunes. 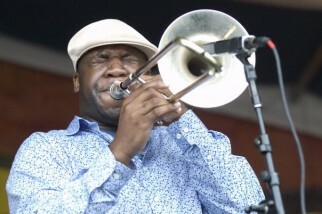 From one of America’s most prolific music cities, New Orleans, Big Sam was formerly the trombonist for the Dirty Dozen Brass Band. He was featured on Elvis Costello & Allen Toussaint’s international tour and their Grammy nominated CDm “The River in Reverse”. Funky Nation has been featured on VH-1, Live with Regis and Kelly and The Travel Channel. The band has played with Dave Matthews, Widespread Panic and Karl Denson’s Tiny Universe. Big Sam began playing with the Dirty Dozen at the tender age of 19 before striking out on his own and creating the Funky Nation. Big Sam powered-up the horn section on the critically acclaimed, Grammy nominated, “River in Reverse” and is prominently featured in “Hot as a Pistol, Keen as a Blade” the concert tour DVD. While touring with Elvis Costello and Allen Toussaint, in the Fall of 2006 and Summer of 2007, he earned consistent reviews as a musical force and star soloist. Big Sam has played with Karl Denson’s Tiny Universe, Dave Matthews, Ozomatli, and Widespread Panic. He has also shared the stage with U2 and Green Day for the emotional and energetic re-opening of the Superdome which was broadcast live on Monday Night Football. BSFN is a festival favorite across North America and their contagious tunes and memorable live performances have attracted fans far and wide, ranging from France, to the United Kingdom, to Greece, to Brazil, to Canada. BSFN is a favorite on the festival circuit and has sealed its mark on the New Orleans Jazz & Heritage, Gathering of the Vibes, Telluride Blues & Brews, Doheny Blues Festival, Austin City Limits, Bonnaroo Arts & Music Festival, Wakarusa, Voodoo Music Experience, Bear Creek Music & Arts Festival, LEAF & many more.